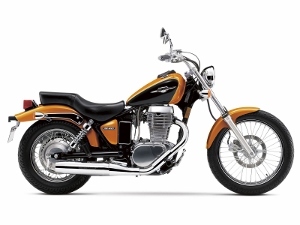 Cruiser motorcycles account for about 40% of the kinds of bikes the North American motorcycling public owns. When the dream of owning one finally becomes a reality, the question may arise - "Did I make the right choice?" This guide may assist you in making the right choice the first time. 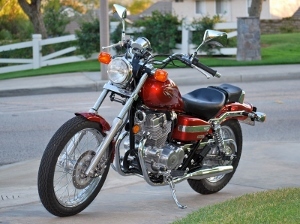 Keep in mind, that although there is a category in the market called "Cruisers," the term covers a variety of motorcycles ranging from small to large, with all intents in between. Typically, a cruiser sports a lean back position, unlike a standard tht works best when you're sitting fully upright. 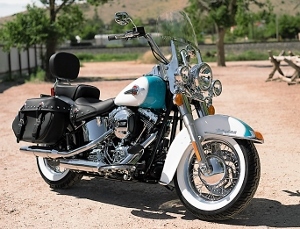 Photo: Harley-Davidson's Heritage Softail Classic. To many it's a dream bike. Toss a little luggage on there and you could ride all weekend to wherever. There are a number of considerations from practicality, to psychographics, that will help you determine the right one for you. 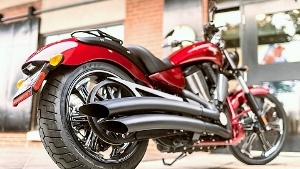 When you think of buying a cruiser motorcycle, what does the future look like to you? Are you using it as a daily commuter and a now-and-then long weekend trip? 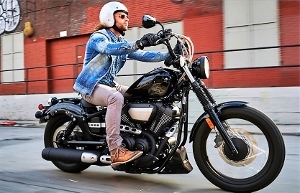 Do you see yourself dressing the part of a leather blue jean cowboy and hooking up with other bikers to go for some brotherly rides together? Do you actually just want to own the bike because it will be beautiful to look at, perhaps even enter it into shows, but not really rack up the miles? Or perhaps you want to dress up like Peter Fonda and cruise your Captain America replica up and down the Oregon Coast? You wouldn't be the first! Knowing the answers to these questions will assist you down the path of selection. As stated earlier, the cruiser typically sports a lean back position. This is important to understand as you'll be supporting the weight of the top end of your body utilizing a number of muscles you don't normally use much in day-to-day life. After 500 miles, that can wear on you if you're not physically up to the task. If you have a bit of a gut, it's even more stressful. Photo: Yamaha's Bolt has been a popular seller with many packages available from dealers. Note the forward ergonomics. If you're a new rider and you think a cruiser is right for you, it's important not to go too large from the get-go. Dropping a full dresser with just a few weeks or months under your belt can be expensive and leave a bad taste in your mouth about riding all together. There are those who chose a large bike to start with, dumped it, sold it back to the dealer and said goodbye to their dream of riding almost as quickly as they got started. Don't let that be the case for you. Photo: Honda's Rebel 250 is a popular starter bike new riders can use to graduate to a larger bike once they've put a few thousand miles under their belts. Resale values are solid as a rock. It's simple enough to start off with a small bike and graduate yourself up to your dream bike over months and miles of experience. We'd like to say putting 3,000-5,000 miles under your belt in the first year of riding is enough to hit the comfort level of moving up to the next size bike, but of course everyone is different, so this is just a rule-of-thumb to work with. In the end only you can know when you're comfortable to go to the next level. Another nice thing about starting small is you can buy a used bike and turn around and sell it shortly after getting back as much or more than you paid for it. Nice starter bikes in the cruiser category include Honda's Rebel, Suzuki's TU 250X, Royal Enfield's Bullet series and Yamaha's V-Star 250. None of these will achieve your dream of riding a hog just yet, but they will provide the means to hone the skills you need to ride a larger bike later. And they all have a good return on value when it's time to resell. And don't let the Harley salesperson tell you a Sportster 883 is a good starter bike - it is not. Too much bike for the beginning rider. Note all the bikes mentioned here are 500cc's and below. Let's be logical. If you've been riding for some time and your skills and agility are at the point you can handle a larger bike, then the world is your oyster. If you're moving from the under 500cc category, we'd advise you consider a 600-1,000cc bike. 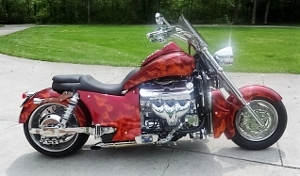 Maybe one more buy and sell experience before jumping into a Triumph Rocket III, H-D Fatboy or otherwise. We see a lot of returning riders. Those who used to ride, got married, had kids, now the kids moved out and these empty nesters want to get back on the road and take up riding again. If that's you, consider yourself a newbie just like the first time rider. A lot has changed in training, so why not sign up for a basic rider program offered by your state and slip back into riding with a skills refresher? Maybe even consider a small to mid-size bike before jumping into a full blown demon chaser. Photo: The Boss Hoss is a favorite among those who like to farkel their bikes and enter them into shows. But would you want to pick one up that just tipped over? And how is that agility? Are you able to pick up a 775 pound bike when you drop it? Perhaps a little getting back into shape is in order as well. Some light weight training, a little yoga? Heck, even an hour a day combination of walking and doing yardwork, does wonders for getting your balance amped up to what you'll need for two wheels. The type of bike you choose will be considered a statement to others about who you are. If you buy a Harley, it's like you're in a special club of Harley enthusiasts wherever you go and many will expect you to have a loyalty to the Bar & Shield and of course America. Yeah - so don't think you're gonna be a big hit at the VTX owners group meeting next month - you won't be. Visa versa if you bought the VTX and think you're going to pair up with the local HOG chapter. That's just not gonna happen. Photo: Victory's Vegas meshes modern and retro styling and is a favorite bit of eye candy for members of the Victory's Owners Club and beyond. Possibly all this tribal bah-bah means nothing to you and you don't plan on pairing up with anyone. Then you just get the bike that's right for you and enjoy the ride! If your plan is to ride several thousand miles a year, surely you'd want to stay clear of a hard-tail bike - the kind with no suspension in the rear. Sure, we've heard the gloating tales of those who rode to Sturgis on their hard tails, but you know while they were on the bikes it was not the most comfortable trip. With the exception of a few OEM models and customs, most cruisers come with front and rear suspension. If you're plan is to do extended touring, look for a bike that is already setup for it, or can be later. Onboard luggage is the first consideration, a tall wind-screen or wind shield would be another. Photo: Suzuki's S40 is a solid mid-range bike and a favorite with pragmatic commuters looking for simplicity and style all rolled into one. And it's not just the price of the bike to consider, but you will also want to account for any additional mods you'll want to add right away. These can come as third party product purchases, or in some cases special packages are available by the model. Practical add-ons include luggage, a wind screen, amped up suspension, a custom fitted seat, bar risers and Kevlar brake lines. Less practical add-ons might include a revised exhaust that is sooooo noisy you're mother knows where you are at all times, leather fringe from bar to bar, custom paint and that cute little bell everyone has affixed to the bottom of the frame. Add-ons and modifications are what makes the bike your bike. Should you go for the dealer offered suspension package, or could you better spend that same money investing in a better suspension setup that's right for you? BMW's introduction of the C class in 1997 certainly turned the cruiser market on its ear. Hailed as both modern in styling and one of the ugliest motorcycles ever produced, if you own a first year model you're sitting on a piece of history. All promoted through that wonderful James Bond movie, Tomorrow Never Dies. 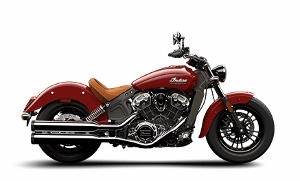 Photo: Back on the market again, the Indian Scout returns with all new technology, but hangs on to retro aspects in it's styling. The best of both worlds? Since then a number of manufacturers have primed the market with modern as well as classic/retro styled bikes. Which type do you see yourself riding? Polaris creates a number of modern styled bikes, but with its purchase of the Indian brand is also covering the retro market well. So this is all food for thought for you as you determine your first or next cruiser motorcycle purchase. We hope your experience is a good one and congratulations in advance on your new bike!